It is equipped with a chain driven power feeder and an adjustable double nose-over at the discharge end to insure a smooth transfer from incline to horizontal plane. SBI has full width galvanized pans. Inclines are easily adjusted up to 30 degrees. This conveyor can also be used as a booster conveyor in gravity flow systems. 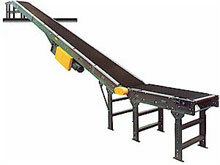 Belt conveyor width is measured in two ways; overall width (or bed width) and belt width. 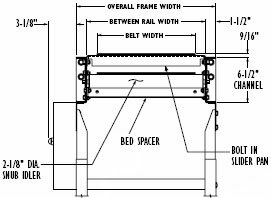 Overall width includes the width of the frame, which extends 3" to either side of the belt. This means that the belt width would be 6" less than the overall width of the conveyor. 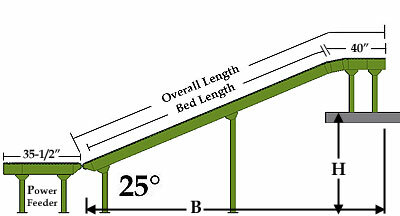 Keep this in mind when determining what width of conveyor you need to meet your package requirements. 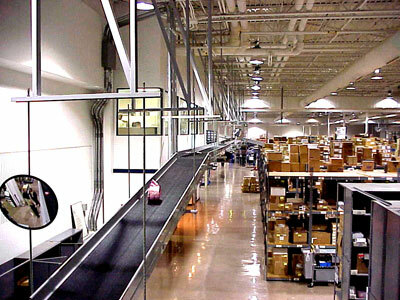 Incline conveyor in a distribution center application.